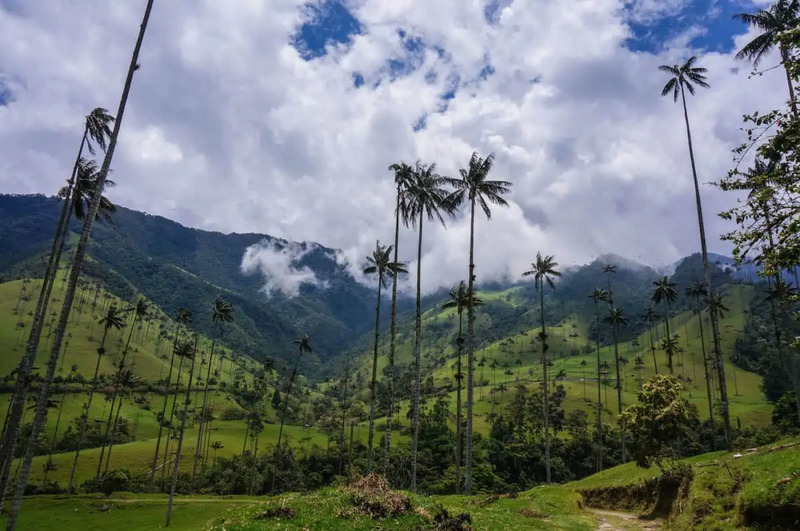 In the rolling green foothills of the Colombian Andes there is a valley that is known for being one of the only places in the world to see wax palms in their natural habitat. 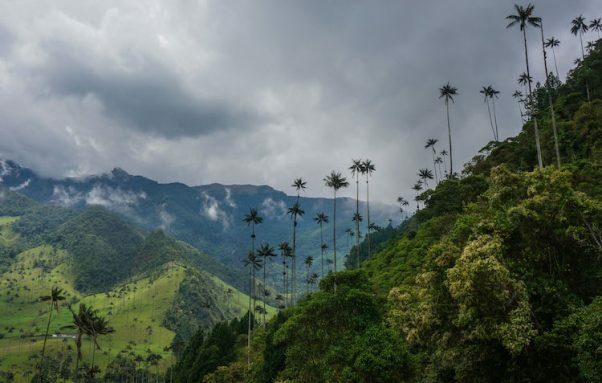 These slender poles shoot up 60 meters into the sky and are topped with a few palm leaves, making them look like they came straight from a Dr. Seuss book! 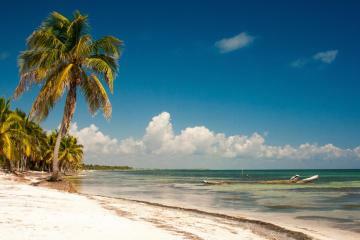 Fun facts, the wax palm is the national symbol of Colombia and the world’s tallest palm tree. 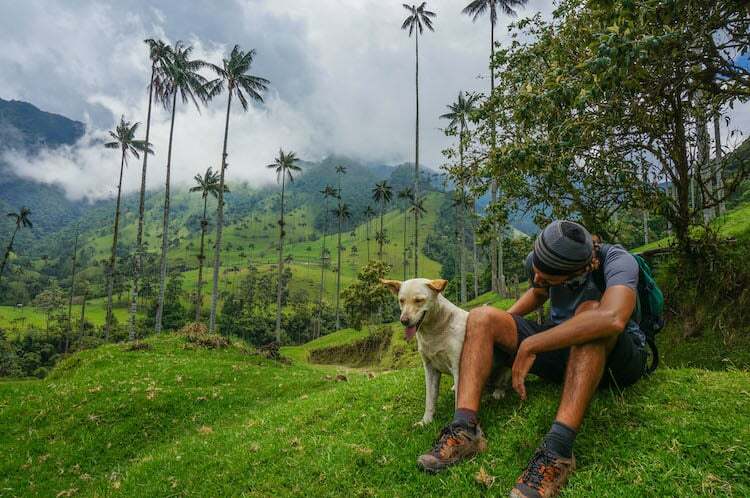 The best way to see these impressive trees and their beautiful surroundings is by visiting Valle de Cocora (Cocora Valley) in the Eje Cafetero (coffee region). 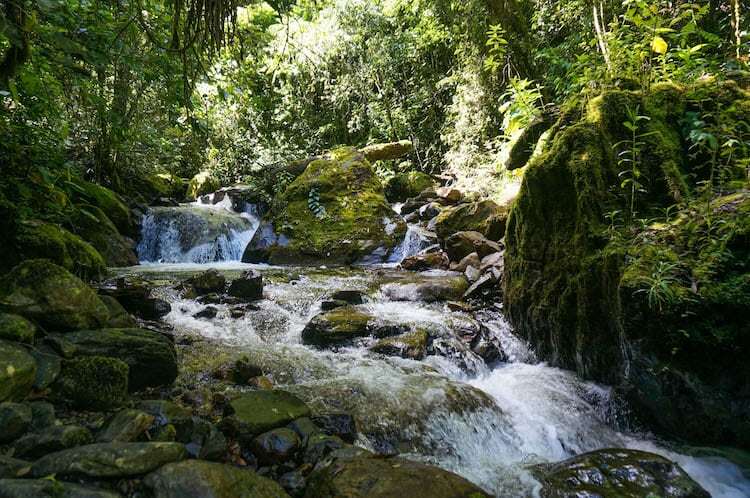 Here in the valley you walk past lush green cloud forest and a river, to come to a clearing with hundreds of wax palms. 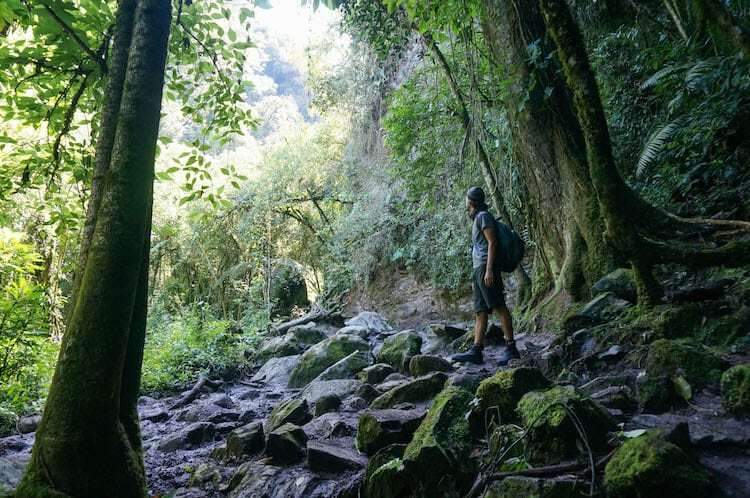 Walking the loop trail is the most popular way to experience the scenery of the valley. If you are staying in the nearby town of Salento like we did, you can catch one of the many Jeeps that leave from the plaza every hour for 3400 COP (2015). 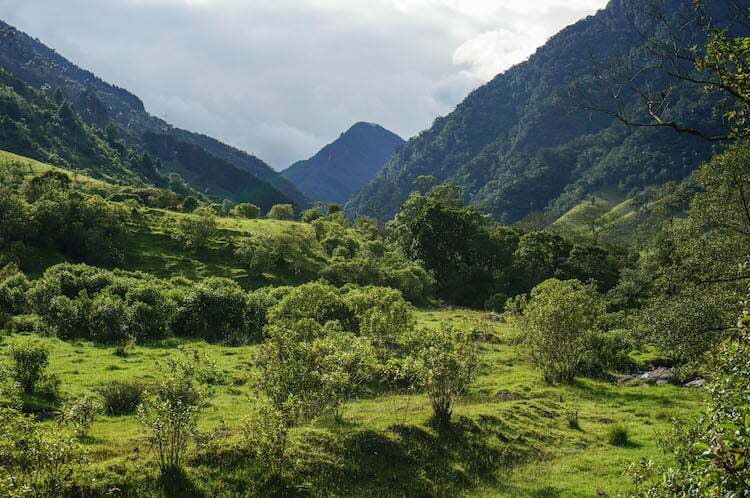 Another option is to stay in the small farming community of Cocora at the trails entrance. 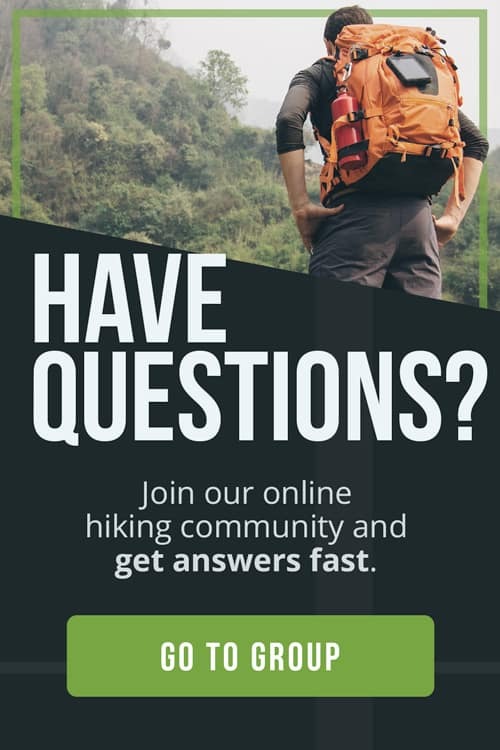 Once you arrive you are ready to start the trail, there is no fee to pay or form to sign. There’s no need to hire a guide because the trail is very well marked. At the entrance of the trail, there are two paths. If you plan on doing the whole loop, we recommend starting from the right. 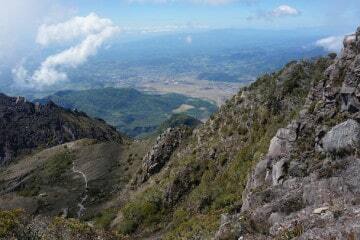 From here you go through an open valley then make your way into dense rainforest. Lucky for us it hadn’t rained the day before and it was sunny so the trail wasn’t too muddy. However, we could see how it would be challenging on a rainy day. 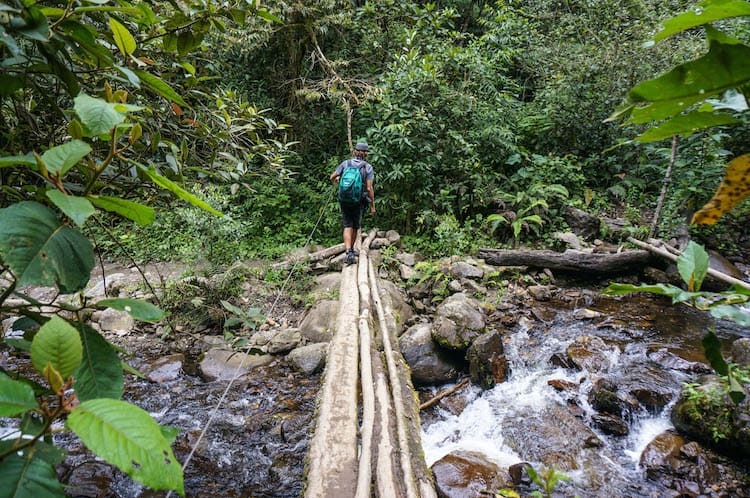 The trail follows a river which you will have to cross back and forth a few times. There are bridges so don’t worry about getting your feet wet. Eventually you come to a sign post, one way to a hummingbird sanctuary, Acaime and the other to Finca La Montaña. Acaime is 1 km uphill off the main trail and costs 4000 COP to enter. If you’ve never seen a hummingbird before perhaps it’s worth a look, also you get a hot chocolate and cheese. 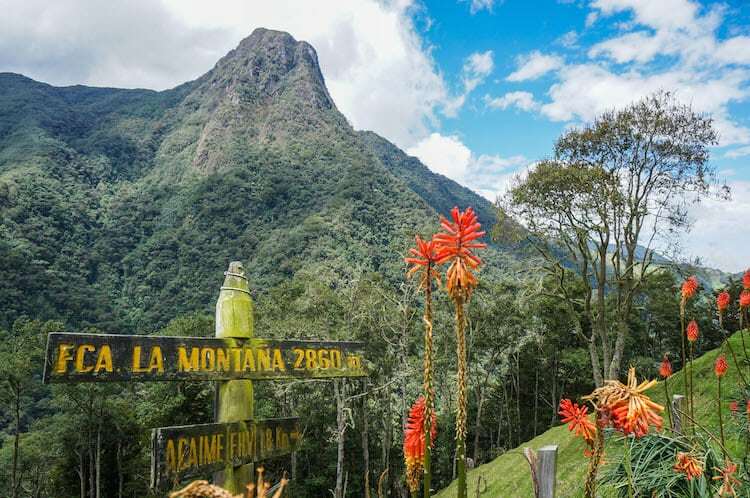 If you aren’t up for the hummingbird detour, follow the trail to Finca La Montaña. This is the steepest part of the trail and if you are out of shape it will be strenuous. The challenge is worth the effort when you reach the finca (farm house) where you can enjoy the view of the mountains and valley below. Also you can enjoy the fact that the rest of the trail is down hill from there! From the top of the hill you make your way down into the valley for the grand finale of the hike, the wax palms. Just when you start to think, you have to be kidding me, where are all those palms from the post card pictures? 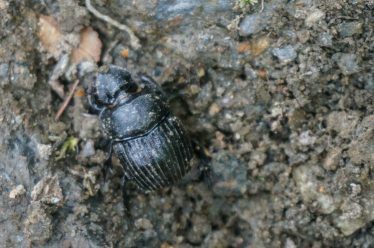 You reach a clearing with hundreds of them. The rich colours of the mountains and sky along with the strange palm trees make for a surreal landscape. From here it’s just a short walk through farmland until you make it back to where you started. 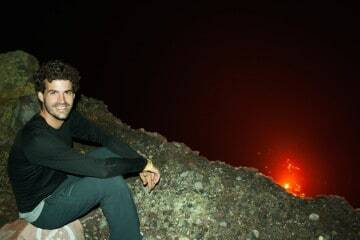 We maintained a relaxed pace and we finished the trail in 3 1/2 hours, stopping often to take pictures. 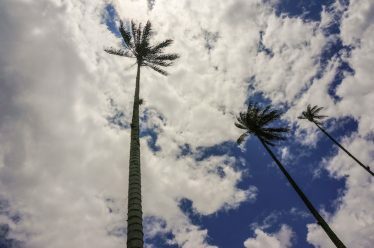 If you are feeling lazy and only want to see the wax palms, you are in luck. Take the trail to the left and within an hour of walking uphill, you will come to the area that is best for seeing the palms. From here you could just walk back down the way you came and be finished with your walk. We’d recommend this option on a rainy day, because the trail is wider and not as muddy as the other section. To get back to Salento you catch one of the the Jeeps lined up at the start of the trail waiting to take hikers back to town. Go early, this area is very green for a reason, it rains a lot and can be very cloudy (especially in the afternoon). Starting early means you will have a more enjoyable experience and a better chance at having clear skies. 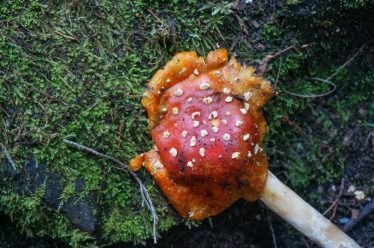 Bring good walking shoes, and a waterproof jacket. Rent rubber boots if it has been raining within the last few days. You can rent them at the entrance of the hike for 4,000 COP. 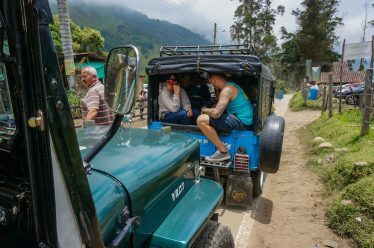 The Jeep ride from Salento to the start of the trail is about 30 minutes. For a reasonably fit person on a dry day the entire loop takes around 3 to 4 hours to complete. The region gets the most rain in April and May. This was the time of year that we went but luckily the weather held up while we were walking. If you are staying in Salento you can catch a Jeep from the plaza that will take you to the entrance of the trail for 3400 COP (as 2015). The Jeeps leave every hour. The surreal landscapes of hundreds of towering wax palms scattered around the valley. The trail is a loop so you don’t need to come back the same way you came. 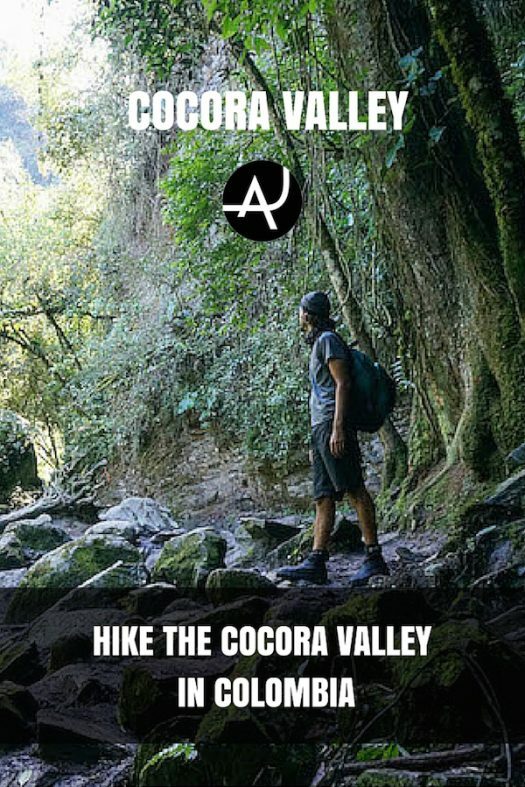 Hiking through the Valle de Cocora is a great way to spend the morning enjoying the outdoors. 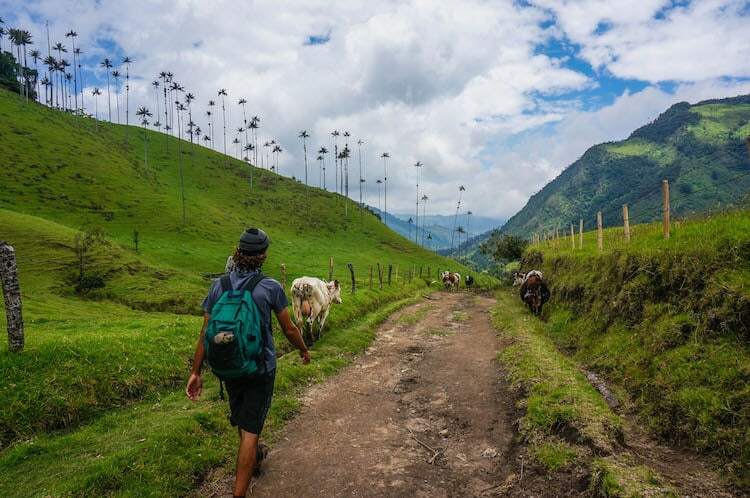 Here you walk past impressively tall palms in a vibrant green valley and enjoy one of Colombia’s beautiful landscapes. Useful Notes: As I mentioned before, this is a cloud forest, which is typically wet and foggy. Even if it’s sunny in the morning, the weather can quickly change so plan for the worst. We ended up wearing shorts and t-shirts but brought a long sleeve shirt and a rain jacket each. The valley is at between 1800 – 2600 meters, at this altitude the sun is very strong so remember to bring sunscreen and a hat.